You’ve begun your marketing career path. Now, are you looking for more training to enhance your skills, bolster your resume, and accelerate your career? This special program is designed to give you access to advanced courses and a certificate program through a flexible schedule and part-time study. Because of the variety of courses and availability, you’ll be able to pursue lifelong learning while maintaining daytime employment or other activities by attending evening or weekend classes or studying as an online learner. 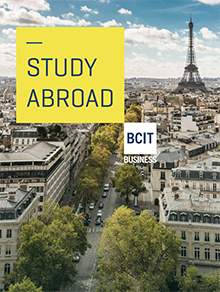 This part-time studies program builds on the BCIT Marketing Management certificate, enabling you to gain additional marketing and general business skills to develop a more well-rounded foundation for more exciting job opportunities and responsibility. Interested? Find out more in the Program Details. Who should complete the Advanced Marketing Management Certificate? Students do not need to apply to start taking courses. If any of these sound like you, apply today at the Program Entry page! By advancing your training for even more in-depth skills, you’ll have the chance to apply your new knowledge to your existing position or move into more rewarding careers. With a wide range of course options, you can choose the facets of marketing that most appeal to your own goals to guide your career to where you want it. Additionally, you’ll have the opportunity to enhance your skills and resume even farther with accelerated training through other BCIT programs, including the Business Administration - Marketing diploma. Learn more about the benefits and opportunities this program provides in the Graduating and Jobs page. Work experience: experience in a marketing related position will be advantageous but is not required. Some entry-level courses are eligible for Prior Learning Assessment and Recognition (PLAR). If you believe that you already possess the skills and knowledge that would otherwise be gained by completing a particular course, please contact the program assistant for application information. You’ll find the courses in this program are designed by working marketing professionals to give you the most up-to-date skills in a flexible format to meet your schedule and career goals. Through the rigorous training, you’ll develop strong, diverse skills needed for success in marketing, including strategic online marketing, public relations, global marketing, and more. In addition to the required ten courses in the program, you’ll also have the opportunity to choose a number of electives that most closely support your future plans and interests. This Part-time Studies program is offered on a course-by-course basis, allowing you the flexibility to complete courses in any order, provided that any required course prerequisites have been completed. Students register for each course individually and may undertake studies in any term (Winter, Spring/Summer or Fall). While you may choose the pace of your studies, all program requirements must be completed within seven years as per BCIT Policy 5103 - Student Evaluation [PDF]. Please note that some courses in this program are offered only once or twice per year, and BCIT reserves the right to cancel courses if enrolment is insufficient. In-classroom delivery is available for most courses in the program. Some courses are also offered online. The length of most online courses is twelve weeks. Online learning students should plan to spend an average of seven-to-ten hours per week on their studies for each course. Note: Each of the courses in this section must be completed to obtain the Advanced Marketing Management certificate. Courses which were included in your Marketing Management certificate cannot be credited again toward this section. This communication course teaches business writing skills needed to write many types of business correspondence. It covers claim, bad-news and sales letters, job applications, and the writing of procedures and instructions. NOTE: Students scoring below "C+" in level 1 COMM are required to take COMM 2002 instead of COMM 2202. To make up for a full-time diploma program level 2 COMM course, students must take both COMM 2202 (or COMM 2002) and COMM 2203 (or COMM 2003). If you have BCIT full-time diploma program level 1 COMM course credit, email cecomm@bcit.ca to apply for approval to register. Prerequisite: Students must have one of the following: 1) a final grade of 70% or better in BCIT level 1 COMM (ie: COMM 1100 or COMM 1103 or COMM 1106 or COMM 1120; or 2) a score of 70 or better in COMM 0015; or 3) an OFFICIAL transfer credit granted for BCIT level 1 or level 2 COMM course with a final grade of 70% or better (refer to http://www.bcit.ca/admission/transfer/). This communication course is designed for students needing additional assistance in meeting the language standards of a credit introductory business and technical Communication course. It teaches practical business communication techniques for planning, organizing, selecting, writing, and presenting information in business or industry. It covers the same content as COMM 1103, but has additional English language support and communication development. NOTE: Students do not need to submit transcripts for entrance to this course. BUT, in the case of formal or informal grade appeals or reviews they will be asked to show proof of their English requirements. Students who wish to confirm their English level are strongly advised to take COMM 0015. Prerequisite: Students must have one of the following: 1) English 12 "50%" (PASS) or equivalent (refer to BCIT's Admission page); 2) COMM 0015 score of 50 or better. Designed as continuing studies for students who’ve completed one of the other part-time certificate programs, the Advanced Marketing Management certificate gives you more in-depth skills in marketing and business. In this program, you’ll broaden your understanding of core business concepts and develop additional marketing knowledge that you can apply immediately to an existing position or to advancement of your future career. Your practical training in marketing management through this program enables you to expand your role with a current employer or seek new career opportunities with another organization. Marketing-related jobs are found in retail, hospitality, advertising, public relations, event planning, tourism and service organizations. Additionally, while many students choose to begin their careers immediately upon graduation, you might choose to broaden your career skills and education by transferring your course credits for an accelerated path toward earning your Business Administration - Marketing diploma.